This British Mark IV Male heavy tank named Lodestar III. It is believed to have been part of the 12th Battalion, Royal Tank Corps that participated in the offensive on the Hindenburg Line near Cambrai in August and September of 1918. It was a gift from the UK. The tank was unloaded from a train flat-back transport at Brussels Etterbeek station having been landed at the port of Antwerp. It served as a gate guardian in front of the Etterbeek Cavalry Barracks at the end of World War One. 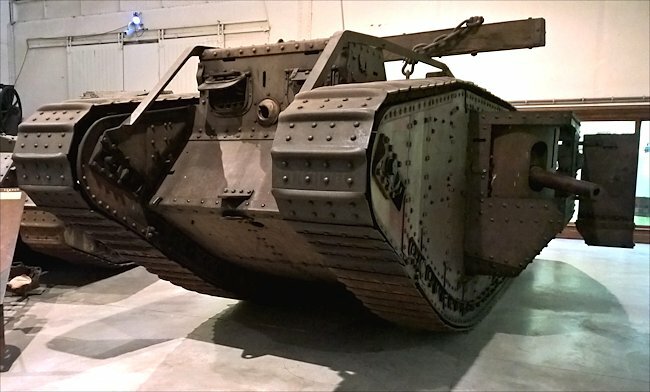 The Mark IV was driven the few miles from the Etterbeek Barracks to the new Royal Military History Museum, which was opened to the public in 1923. The Museum is called Musee Royal de l'Armee et d'Histoire Militaire Bruxelles en Belgique. British tanks were painted white with red stripes for identification purposes because the Germans had started to use captured British tanks against their original owners. Red and white are the colours of the English flag of St George. 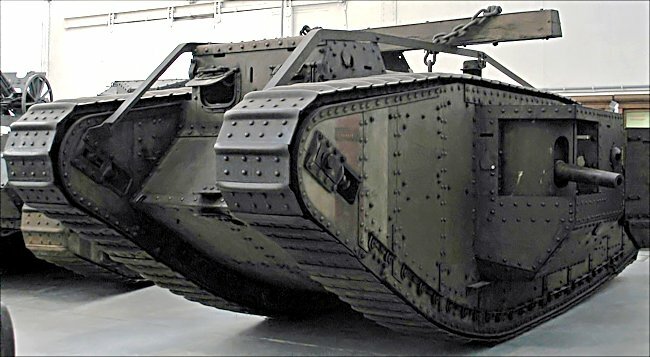 The British Mark IV Male tank was produced between May 1917 until then end of the war in late 1918. 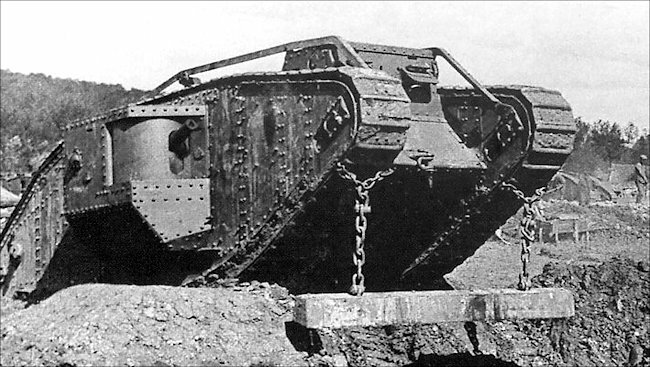 In total 1,220 were produced which made it the most produced version of WW1 British Tanks. They were not all male tanks fitted with 6pdr guns. Only 420 were male tanks. Female versions of the Mark IV tank were more numerous as 595 were built and 205 tank tenders were also constructed. 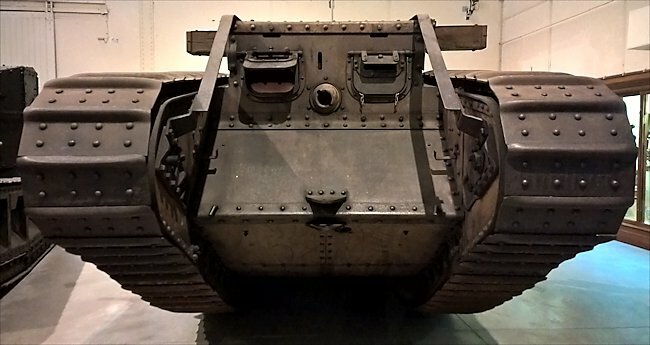 These were unarmed armoured supply vehicles that could take ammunition and equipment up to the front. 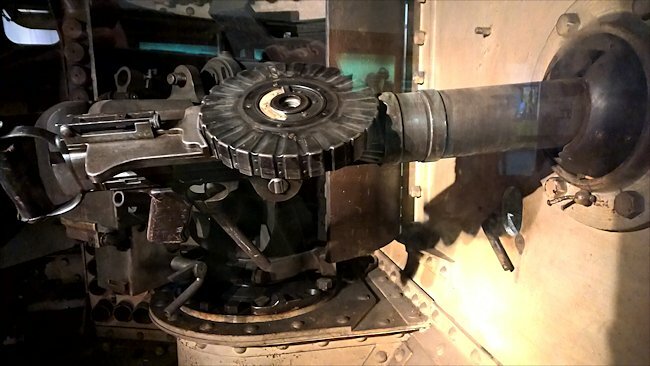 The Male MkIV tank was armed with two 6-pounder (57 mm) 6 cwt quick firing QF guns, one each side and behind both guns was a .303 Lewis Machine Gun in a ball mount in the sponson. There was another machine gun in the front of the tank hull. It was powered by a Damiler-Foster 6-cylinder in-line sleeve valve 16 litre petrol engine that produced 105 hp. It had a to speed of only 4 mph (6.4 km/h) and an operational range of only 35 miles (56 km) before the crew needed to refuel the tank. German Leutnant Jakubasch of 4th Battery, 213th Field Artillery Regiment was in charge of some of the field guns at Flesquieres. 'Tanks suddenly appeared to our front around Flesquieres. I ordered sights to be set at 700 meters. With our third shot we knocked out a tank. In short order we followed this with three more. Then with my one remaining gun dealt with four tanks.' It was like a shooting gallery. The British Mk IV tanks were rolling over the hill not knowing what was waiting for them. Deputy officer Otto Alt 4th Company 27th Reserve Infantry recorded, "At close quarters with direct fire our courageous artillery destroyed all tanks within range. An impressive amount of these expensive pieces of fighting equipment were strewn around the battlefield like so much scrap iron." The German Army did not have enough of these anti-tank units to stop all the advancing British tanks. The gun crews had very little protection from the tank machine guns or shell fire. Their main defence was the long range of their gun. If they could destroy the tanks before they got too close they had a fighting chance of surviving the engagement. During two days of fighting the allies lost 179 tanks. Not all this number were destroyed by enemy fire, many were abandoned due to mechanical breakdown. The tanks with the help of the infantry eventually took Flesquieres and continued on to their main objective. The tanks used in the battle of Cambrai made good ground and covered more than 30 km but the victory was illusionary as what is often forgotten is that German Storm troopers took back the same ground within a few weeks with very little casualties. 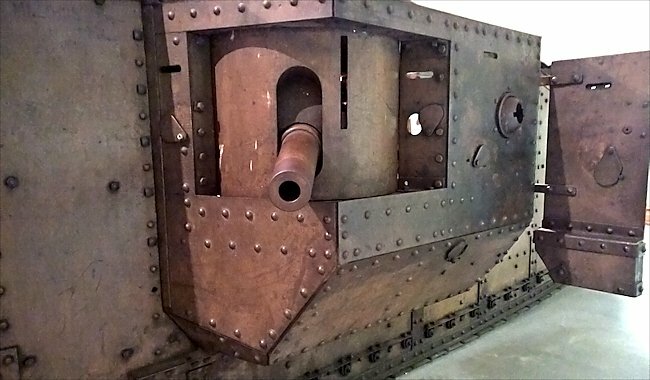 I consider the battle of Cambrai is more import as an example of the first successful use of an anti-tank gun than the use of mass armour in an attack. The British MkIV tank had been modified and the 6 pounders had been cut shorter. Instead of having to take the gun sponsons off the factory had built it so that the flange that connected the gun sponson to the Tank was inside, so that all we had to do was to take out the bolts and push the sponson inwards sufficient to get clearance when passing other traffic and going through narrow streets. You couldn't do this with the long gun of course on the older tanks, so the 6 pounder was cut short and pushed back on its mountings which was a great improvement. 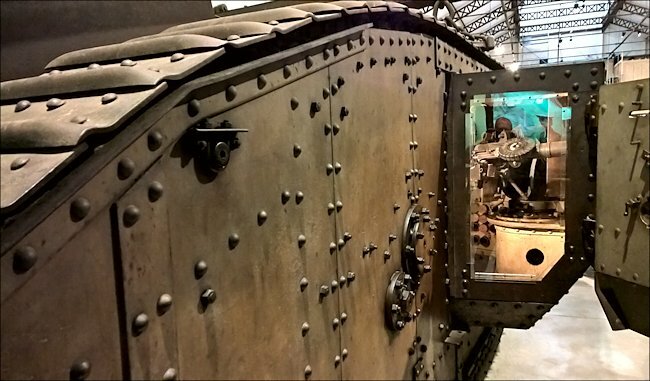 Under very bright lighting the true olive green colour of this British WW1 MkIV Male Tank at the Musee Royal de l'Armee et d'Histoire Militaire in Bruxelles can be seen. The Germans would play a machine gun up and down the outside of a Tank and as far as they could see where there were little loopholes and what have you They didn't always pierce the loopholes, but they would splash lead pieces from the bullets and the little splashes would often come through and get into your eyes. This is why the crews would wear protective masks, but these obscured your vision so much that you couldn't always tell what you were supposed to be doing. You couldn't really see through them because if you had it low enough to stop the splashes you couldn't see what you were doing. What you used to do was try to shield your eyes with your hand and just put up with it. You couldn't hear yourself speak inside a Tank and when the first driver at the front wanted a gear changing at the back he would bang on the engine cover and put two fingers up for second gear, one finger up for first gear and two fingers down if he wanted neutral. We had no method of communication with other Tanks. Photo of the unditching beam chained to the tracks ready for action. We were supposed to carry a man with semaphore flags, but obviously you couldn't put a man outside with flags as he would be shot at. There was an idea for using mechanical semaphore, but it was no good, you couldn't control it and there was no time to do it. There was an idea to have a telephone cable trailing out behind you, but the noise was so terrific that it would have been impossible for anyone to speak to you.